Successfully Added Christmas Ball Digital Picture Frame to your Shopping Cart. Holiday digital picture frame shaped as red Christmas ball that can be hung from the tree or sit on the desktop. Want to give the kids a special new ornament to hang on the tree this year? Want to put a unique digital picture frame on your desktop? Then have we got something for you! 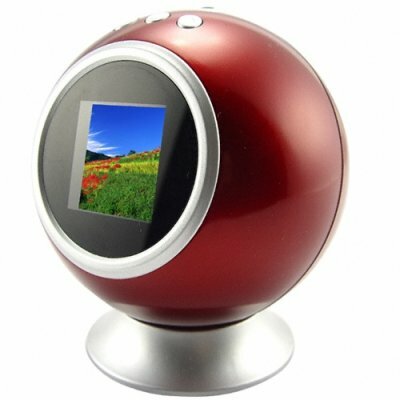 A battery powered digital picture frame styled as a holiday ball. What better way to re-live the memories than look at them on this great digital picture frame? How best to use this ornament? Simply plug in two AAA batteries, transfer your pictures onto it via the provided USB cable, and you are all done. Then you can either place it on your desktop using the provided stand or hang it from your Christmas tree. This beauty is about as easy to use as it gets! This great digital Christmas ornament is in stock now and can be ordered (while supplies last) at a low wholesale price for re-sale on your internet or physical store. From the original direct from China no M.O.Q. (no minimum order quantity) wholesale supplier, Chinavasion. Includes and additional clock function - count down the hours till Santa arrives!